The NFL once barred Terrelle Pryor from five games for getting free tattoos in college. On August 1, Josh Gordon will appeal his one-year suspension for testing positive for marijuana. And Thursday, Baltimore Ravens running back Ray Rice will get a two-game suspension — for knocking his fiancée unconscious at an Atlantic City casino. The Ravens expected to be missing Rice at the beginning of the season following his arrest last February, and with the minimal suspension they are not expected to appeal the decision. After the Feb. 15 altercation, horrifying security footage emerged showing Rice dragging the apparently unconscious Janay Palmer (now his wife) out of a casino elevator. He was charged with felony aggravated assault, but the first-time offender skirted jail time by entering into a pre-trial intervention program. Rice must also pay a $58,000 fine for violating the NFL's "personal conduct policy," which amounts to roughly one percent of his estimated $7 million take home per season. You know, just to throw a little extra something-something in what amounts to a stern finger wagging from the NFL. ESPN's Adam Schefter broke the news on Twitter Thursday morning, which has since created a social media firestorm criticizing the NFL's astoundingly light punishment. "I won't call myself a failure. Failure is not getting knocked down, it's not getting back up." Then Palmer, who has since gotten married to Rice, added this: "I deeply regret the role I played in the incident that night." The entire time, the Ravens' social media redistributed the quotes in a supportive manner. Let me be very clear: No instance of domestic violence should be taken lightly. None. 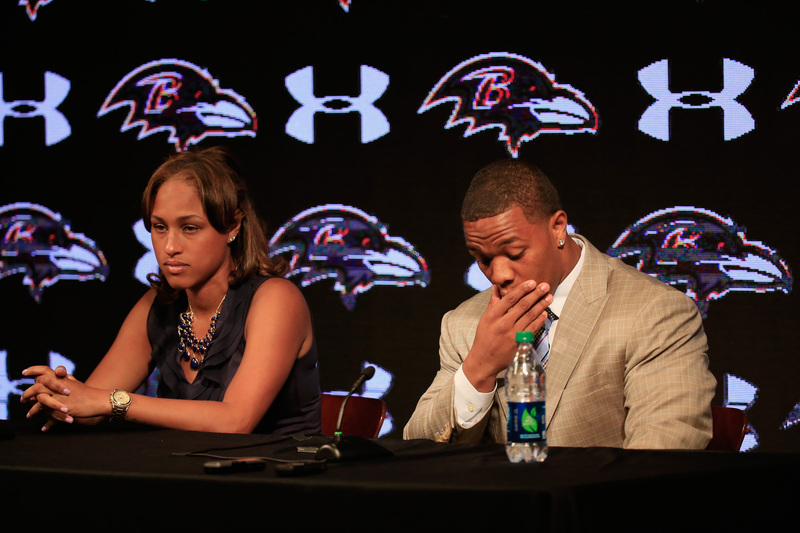 But the security footage, the Ravens' mind-boggling and unwavering support of its player, and Rice's star role in the NFL made this a very public, high-profile issue. It was the NFL commissioner Roger Goodell's chance to crack down and demonstrate that the league takes these issues seriously. This punishment makes it abundantly clear and infinitely puzzling that the league is more concerned with handouts and drug use than it is with domestic violence. It's time for the NFL to revisit its personal conduct policy. Because if a violation only garners a two-game suspension and what amounts to chump change-fee, it is clear that they don't value women.